1.文中列举出的收益缺乏相关研究支撑.个人认为这是一个trade-off的过程,需要更深入的评估.我关心的是如何养活这些绿植,答案当然是得靠土,水,肥. 土:从哪儿运来这么多土,又要花多大代价改造屋顶,再花多大代价把土运上去,在着整个过程中产生的扬尘怎么控制(这个虽然简单,在短时间内的环境影响不能忽视); 水:把水运上去的代价呢; 肥:这个作为非农业源氨排放,是最容易被忽视的(详情请移步 Chang, Y., Liu, X. et al. (2012). "Stemming PM2.5 Pollution in China: Re-evaluating the Role of Ammonia, Aviation and Non-exhaust Road Traffic Emissions." Environmental Science & Technology 46(22): 13035-13036. )!以往都注重SO2,NOx的减排,但如果没有NH3的参与,它们不可能转化为二次气溶胶(PM2.5的主体),含氮肥料的使用将导致NH3的挥发,根据城市绿地经验,要养好这些绿植则年需氮量应为400 公斤/公顷,接近华北农田平均施氮量(500公斤/公顷). 1. The benefits listed in the article are not supported by research. Personally, I think it's a process of trade-offs, which needs deeper assessment. I'm worried about how to grow these green plants. For example: where can we get enough soil? How much do we need to spend to rebuild the roof and move water and soil on it? And even more, how do you control the dust raised during the process? (This may be quite easy but can't be ignored as it causes bad environmental effects). Fertilizer, as non-agricultural ammonia emissions, is quite easily ignored (for details, please see:Chang, Y., Liu, X. et al. (2012). "Stemming PM2.5 Pollution in China: Re-evaluating the Role of Ammonia, Aviation and Non-exhaust Road Traffic Emissions." Environmental Science & Technology 46(22): 13035-13036 ). In the past we focused on emission reduction of SO2 and NOx, but without NH3, it is not possible to transform to secondary aerosols (main body of PM2.5). The use of nitrogenous fertilizer well lead to NH3 volatilization. According to the experiences of urban green spaces, these plants need to keep a annual nitrogen demand of 400 kg/ha, close to the North China farmland average nitrogen fertilization rate (500 kg/ha). I will applaud anyone who solves these problems. 2. Besides this strategy, there are other effective, low-cost measures that can be used. For example, the highest organs should put more pressure on CNPC, CPCC and CNOOC, and get the sulphur content of vehicle gasoline and other indicators up to international standards, as well as tighten the vehicle use of departments and ministries. In addition, Beijing, Shanghai, Guangzhou and other big cities should set a goal of zero consumption of coal (our research shows that if we can reduce ammonia emissions within cities, that will largely reduce particulate matter pollution, but the results are not yet published, so this is for reference only). Thanks for the comments on the article. Once an academic paper is published is will link it. True, trees are much more effective in cooling than grass and green belts or additional trees would definitely have an impact. The difference is that green roofs are able to cool rooftops that normally reach high temperatures in dense urban areas. This means that the cooling has a direct effect on the city residence. Green roofs do not normally use regular soil because it’s weight and concentration of organic matter. In this study extensive green roofs with 10cm thick substrate were used, which can be placed on most roofs without additional structural reinforcement. The issue of fertilizer is important, with guidelines and further research needed to ensure it is not become a problem. True, there are probably more effective ways to directly address air pollution. But when looking at green roofs as a solution all the environmental benefits need to be taken into account. Green roofs should start from design, combined with three-dimensional green agriculture. The best choice is roof greenhouses. The design of roof greenhouses should be considered in new buildings. They have high performance-cost ratio and benefit for waterproof and heat preservation of buildings. Hello Gavin Lohry, I am very interested in your argument. Could you provide your data sources or statistical method? For example, when you say 93,000,000 square metres, 800,000 tons, the emission of 730,000 cars, 6.5 degrees Celsius etc. Thank you. Could you please let me know, what is the references of data in your article? 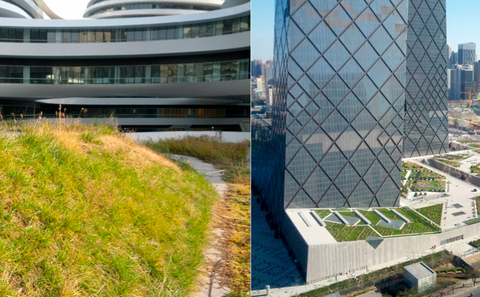 For example you mentioned “Beijing has 90 million square meters of potential green roof space “….